Happy Thanksgiving, Retrowatchers! I hope you all had a lovely holiday. This year, I am thankful for my renewed interest in writing and blogging, Netflix’s massive DVD library (and Hulu, when the DVDs arrived damaged), all of you who read Retrowatching, and of course, for Mary, Ted, Rhoda, Lou, and Phyllis*, James Burrows, Allan Burns, Treva Silverman, Martin Cohen, Steven Pritzker, and everyone else associated with the great Mary Tyler Moore. *Ok, fine, in the spirit of the holidays, I can be thankful for Murray, too. We’ve arrived at the end of season two. It’s been a long journey, and not necessarily as easy as season one, but I’d say overall it was a good season. We learned a little more about the kind of man Lou is in “The Six-and-a-Half-Year Itch.” Bess Lindstrom became a real character, had some wonderful scenes with Mary, held her own with Lou, and reminded us that Phyllis always means well. Rhoda continued to be her awesome self (with one exception, to be discussed shortly). Ted remained Ted, as he should, but we learned a bit about his upbringing and his insecurities in “Cover Boy”, “And Now, Sitting in for Ted Baxter”, and “Ted Over Heels.” And Mary continued to be a pushover just on the brink of annoyance, and a Golden Person. Perhaps most surprising of all (at least to me), is that Phyllis got several chances to shine, particularly in the last third of the season. You may recall Phyllis was a character I took issue with almost immediately. One of the strengths of season two is the reassessment of her character. She’s still the Phyllis we first met – selfish, generally irresponsible, out of touch, and overcompensating – but she’s also more. Despite her unconventional ways, she is a good mother with her daughter’s best interest at heart. She’s also a good friend – not only to Mary, but I would argue also to Rhoda. (See: Their shared excitement for Mary’s big date in “The Five-Minute Dress” and her genuine looking out for Rhoda’s career in “The Square-Shaped Room”). Phyllis was used frequently in season two, and consequently, she HAD to become more than just the nosy and slightly annoying downstairs neighbor. I’m not going so far as to say that she is among my favorites, but she’s come a long way. I can see the beginnings of the character development that eventually lead to a spinoff. Very easily the worst episode of MTM precisely because it ISN’T an episode of MTM. At least the poster is clever. Staffer Girl 1: So then what are you going to do tonight? Staffer Girl 2: Oh I’ll either go out with a fantastic man to dinner and a movie, or if I don’t meet one, I’ll just go home and clean the oven. And imagine, the show didn’t get picked up! There’s not much else to say about “His Two Right Arms,” except that Bill Daily’s performance as a fumbling politician isn’t terrible. Evidently MTM agreed, as Daily was cast* in a similar role that fall as the “the friendly but inept neighbor”** Howard Bordon in The Bob Newhart Show. *My guess is that Daily had some type of deal with MTM Enterprises or CBS and when “His Two Right Arms” flopped, he was given The Bob Newhart Show. **Character description from Wikipedia -I’ve never seen the show. Am not sure it will make the Retrowatching list, as Newhart is someone I respect but for whom a little goes a long way. Shake it off, Retrowatchers. Shake it off. 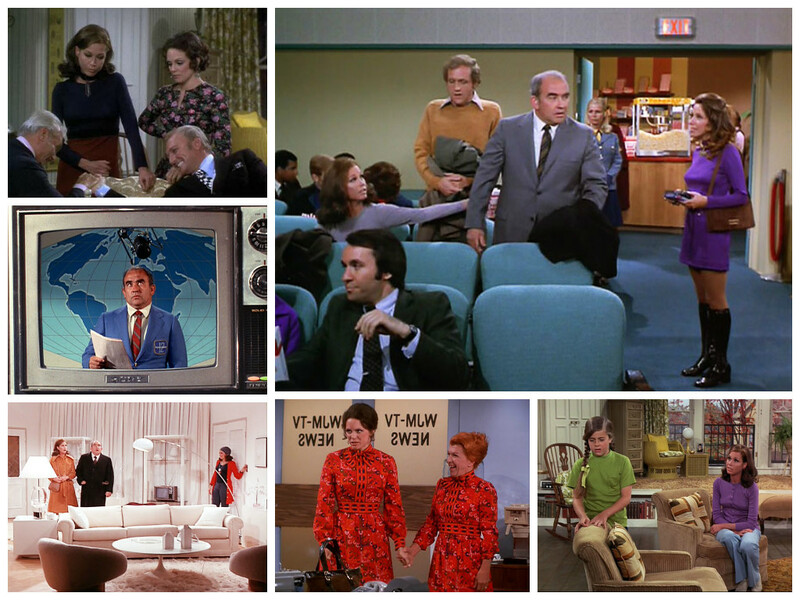 Let’s get back to the ACTUAL Mary Tyler Moore show. Speaking of unsuccessful backdoor pilots*, “Where There’s Smoke, There’s Rhoda” and “You Certainly Are a Big Boy” were both written by Martin Cohen. Cohen isn’t quite up to Silverman status as an MTM writer, but he has yet to deliver a bad episode. Remember when Lou read the news in “Thoroughly Unmilitant Mary?” Cohen. Mary’s anguish at leaving WJM in “Party is Such Sweet Sorrow?” Cohen. These two are no different. *As previously established, Martin Cohen is the co-creator of Who’s the Boss, a show that had a whopping THREE backdoor pilots: “Charmed Lives” airing at the end of season two and featuring Fran Drescher, “Mona”, airing in the show’s third season, and “Living Dolls”, in season five. Of the three, “Living Dolls” made it to series, though it only lasted 12 episodes. I don’t remember “Charmed Lives” but I DO remember “Mona” and “Living Dolls,” the latter because it starred a young Leah Remini as a friend of Sam’s who goes to New York to become a model (hence, the title). Not sure why I remember “Mona” – the episode revolves around Mona’s brother buying a hotel and asking Mona to help him run it. Maybe because there are flashbacks to Mona’s childhood? Either way, it’s memorable. Both “Living Dolls” and “Mona” are good episodes in my head -certainly better than “His Two Right Arms”- but I saw them when I was a kid, so who knows? 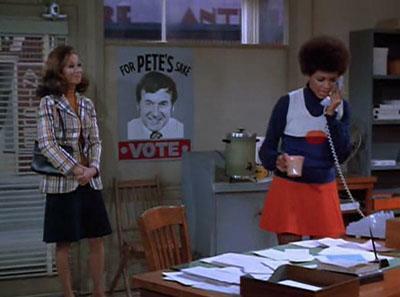 While they are both good, “Where There’s Smoke, There’s Rhoda” is the stronger episode. 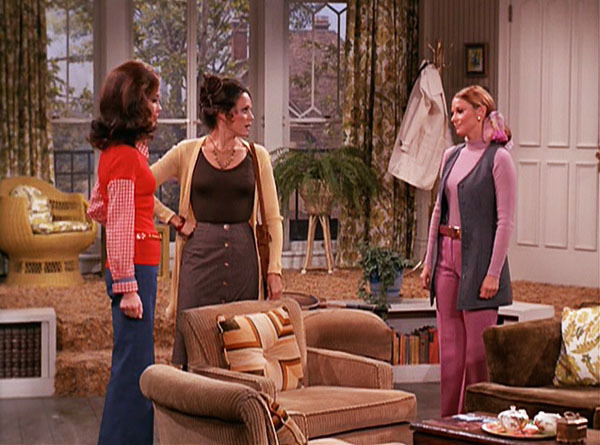 Rhoda’s apartment catches on fire and Mary opens her apartment up to Rhoda until it can be repaired. A match made in heaven right? Wrong! Rhoda and Mary make excellent best friends, but terrible roommates. Well, let’s be fair: Rhoda is a terrible roommate. You know I love Rhoda Morgenstern, but it’s the truth. She’s messy, she stays up late (a problem when sharing a one-room apartment), she takes advantage of Mary’s offer to lend her some clothes, she blames Mary for not waking her up when she is late for work, and worst of all, she makes a huge mess in the kitchen and LEAVES THE DISHES SITTING OVERNIGHT. This marked the first time in MTM history that I was firmly on Mary’s side instead of Rhoda’s. I side with Rhoda when it comes to her difficulty with Mary being a Golden Person. 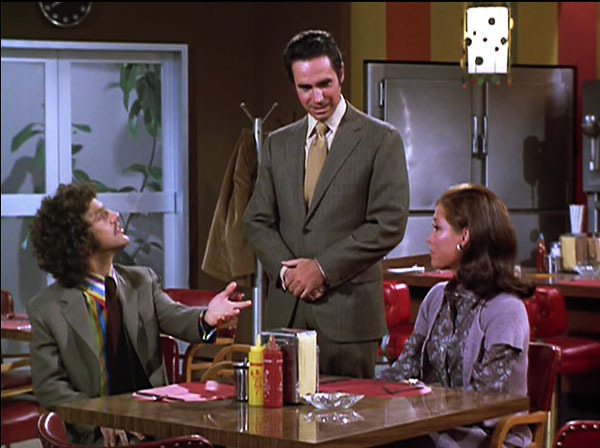 I side with Rhoda when Phyllis gives her a hard time about her weight or single status. I even side with Rhoda when she redecorates Lou’s apartment into a blinding white monstrosity. But girl: You are a guest in Mary’s home. Pick up after yourself, get to work on time, do the damn dishes and most important: stop taking advantage of your best friend’s generosity! When you’ve got Phyllis giving Rhoda grief over taking advantage of Mary (“You may have Mary jumping for you, Rhoda, but not me.”) there’s a problem. This is what bothers me the most: Rhoda is constantly telling Mary to stick up for herself and not be such a pushover, and yet when the opportunity arises, she takes advantage. She gives Mary a guilt trip over the sad little cot Mary procures for Rhoda to sleep on, so they trade off nights. She tells Mary she couldn’t possibly go to sleep at 11:30 p.m. (really, Rhoda?) and keeps Mary up watching the portable TV. All of her clothes are destroyed, and she wears Mary’s new nightgown and best suit without asking. Not exactly best friend behavior. Fortunately, Rhoda makes good in the end. After two nights, she decides to go to a hotel: “My apartment isn’t going to be ready for another three days. How long can we continue this Oscar and Felix routine?” she asks Mary. She says that Mary is driving HER crazy: Mary’s morning cheerfulness is like living with Dinah Shore (okay, I will give her that one – cheerful morning people are THE WORST), Mary’s a neat freak, and worst of all, Rhoda knows that she is driving Mary crazy. When Mary protests, Rhoda says: “Mary, please. I have been nice enough to tell you how impossible you are to live with, you might at least extend me the same courtesy.” There’s the Rhoda I know and love! Welcome back! *They still need improvement – see “The Five-Minute Dress”, “I Am Curious Cooper” – but the dating stories got marginally better this season. They also became less frequent. One of the funnier bits in the episode is all of the men being perplexed by and jealous of Matt Bryan’s youthfulness. He is 44 – only two years younger than Lou – but the differences are vast. The best scene comes when Matt’s son, Matt Jr., visits Mary in the newsroom and Ted mistakes him for Matt Sr.
Last but not least, we come to the ACTUAL finale of season two, “Some of My Best Friends Are Rhoda.” Guys, this is heavy. It could be deemed “A Very Special Episode,” as it deals with a sensitive topic, but its so well written,and the confrontation scene is so well acted, that it doesn’t come off as heavy-handed. We know writer Steve Pritzker can do funny (“Second Story Story”, “More Than Neighbors”), and we know he can combine funny with bittersweet (“And Now, Sitting in for Ted Baxter”). We can now add the tough combination of funny and serious to his resume. The issue dealt with here is antisemitism. Mary meets her new friend/potential BFF Joanne when Joanne accidentally rear-ends her. 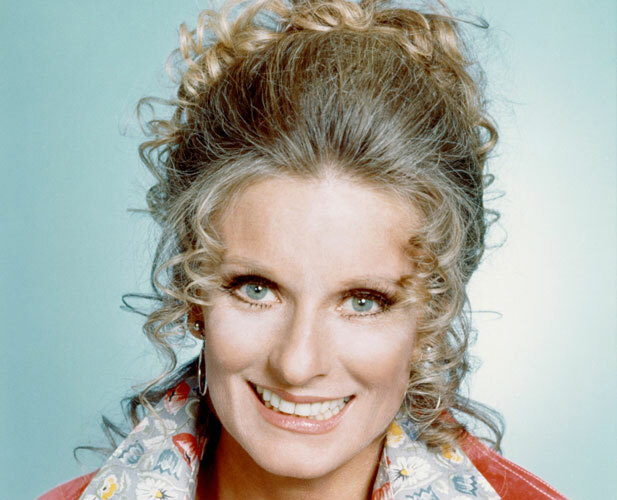 My notes say, “Whoa, first thing I notice, Joanne looks and dresses a lot like Rhoda.” It’s true – Joanne, as played by Mary Frann – seems like a prettier, more put together version of Rhoda. She, too, wears scarves in her hair and plays tennis. Except her scarves are nicer and her tennis court isn’t in a high school, but a country club. Naturally, Rhoda feels threatened, especially when Mary starts to spend all of her time with Joanne. The climax of the episode – in which Mary discovers Joanne’s true colors and finally grows a spine – is so well done that not much can really be said. Props to Frann for playing a flawed and thankless role so well. You did your job, Ms. Frann – I didn’t like you, despite your cute hair. And props to Moore, for playing a difficult and complicated scene convincingly. It really COULD have gone “Very Special Episode”, but didn’t. 1.) Yowza, Mary Tyler Moore! How great does she look in that tennis outfit? Also how cute is the little bit with her practicing tennis? I decided to leave it in because it’s such an endearing little scene. 2.) Antisemitism seems like a weird topic for a TV show in 2013 (though I guess it still happens), but this originally aired in 1972. If Mary and Rhoda are supposed to be about 30-31, that means they were born in 1941-42, during World War II. It’s not so crazy to think that antisemitism was still a harsh reality in the United States. – Rhoda cooks dinner for Mary in her teeny tiny kitchen – chicken horseradish soup. I love horseradish, but this just sounds disgusting. – Cooking in a real kitchen is a big step up for Rhoda, as she only has a hotplate. 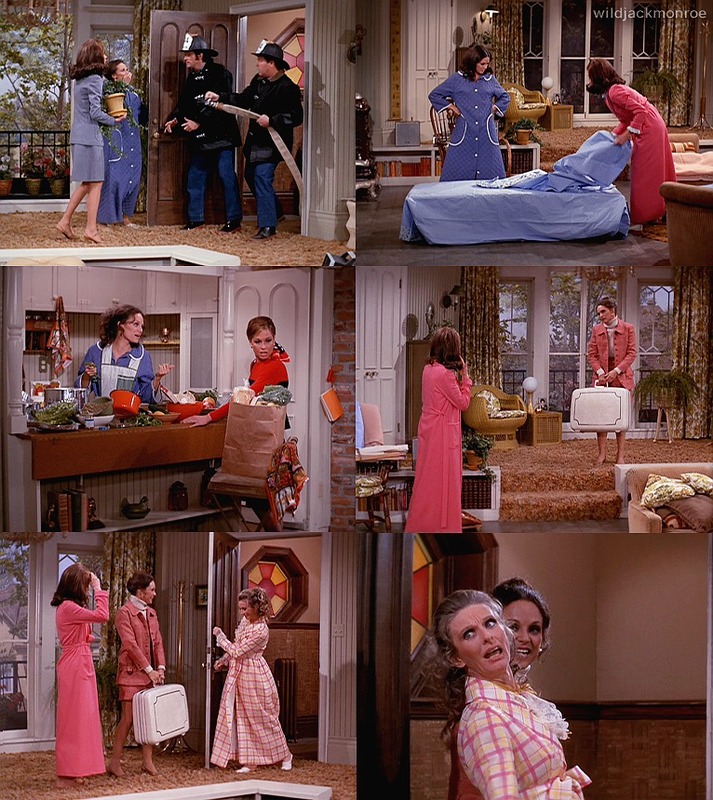 How is it possible that Rhoda doesn’t have a kitchen? – Matt Bryan Sr. asks to take some sketches of Mary’s apartment and ends up sketching her. Not a bad pickup, sir. Not bad at all. -Rhoda and Mary make up their own rules for tennis. For instance, they don’t play with a net. I want to hang out with them so badly. -Phyllis is very excited about Joanne as a Rhoda replacement. I actually thought she would pick up on Joanne’s slipperiness, as Phyllis has been more aware lately. – I wonder how many backdoor pilots have actually made it to series. This article from The AV Club discusses failed pilots. This article mentions a few recent successes (Private Practice, The Originals). Most of what I could find focused on the failures. Anyone know more successes? – Lou tells Mary to pull Matt Sr.’s file (Murray did a story on him) and he tries to tempt Mary into looking at it. This is what people did pre-internet. – Lou says that Ted should be on a half hour after the Star Spangled Banner – TV did actually used to shut off at some point at night, didn’t it? – Rhoda: Do you have any horseradish? Phyllis: Isn’t that kind of a strange way to greet somebody? Mary: How about strong mustard? Phyllis: Doesn’t anybody say hello anymore? – Murray: I hope I look that good when I’m his age. Lou: Murray, you don’t look that good now, why should it get any better? -“You look like a cheerleader for the school of nursing.” – Rhoda on Mary’s new tennis whites. -You take yourself and you don’t ask questions. -Rhoda knows what to take in a fire. Mary grabs a plant and her decorative M. Oh, Mary. And that will do it for this week. Whew – we made it through season two! Up next: season three, aka the last season currently available on Hulu, for anyone following that way. Subsequent seasons are available for purchase on Amazon streaming, or you can do it the old fashioned way like me, via Netflix DVDs. I hear season three is a good one for Ted, so I’m excited. Let’s hope it’s also the season they make Murray interesting. – What is Mary Richards Really Like? – Who’s In Charge Here? This entry was posted in Classic TV watch, People I want to befriend, tv and tagged classic TV watch, Mary Tyler Moore, Mary Tyler Moore Season 2, tv writers by Sarah. Bookmark the permalink.